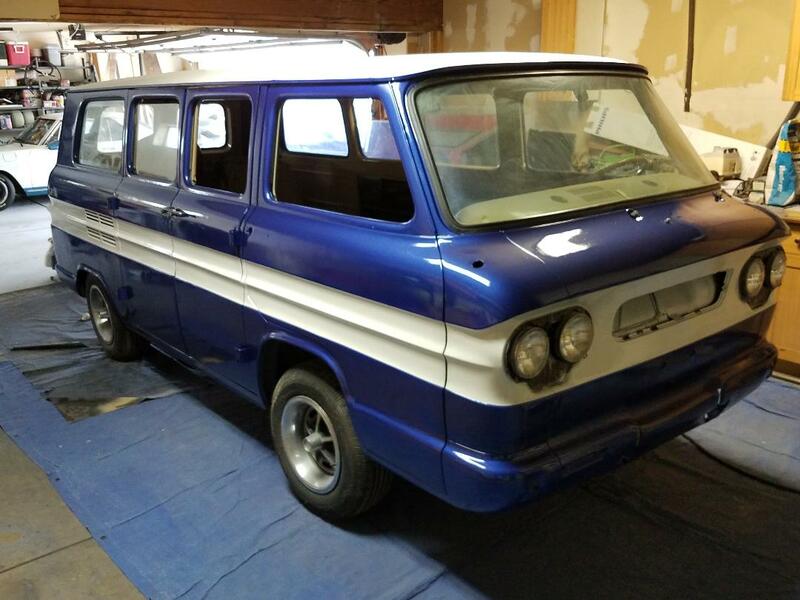 This 1963 Greenbrier (110/4-speed) was obtained by the Pershing family around 1975 when they lived in Colorado. 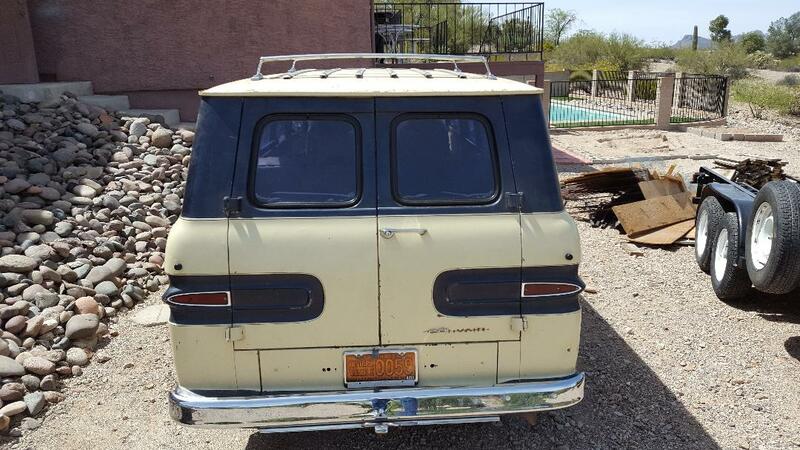 It was used as the family car for about 15 years and 140,000 miles. 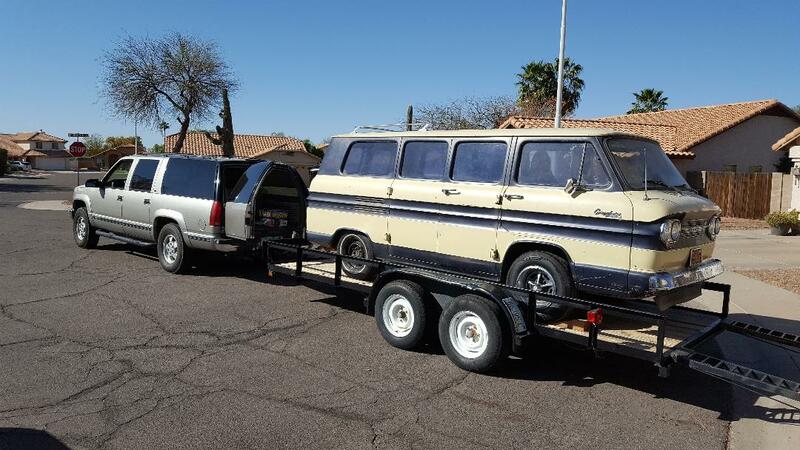 I was replaced by a Suburban and ended up with a friend who used it as a Boy Scout hauler for a couple of years and then parked it in his garage until April 2018 when he willed it back to the Pershings in pretty much the same condition as when it left home. 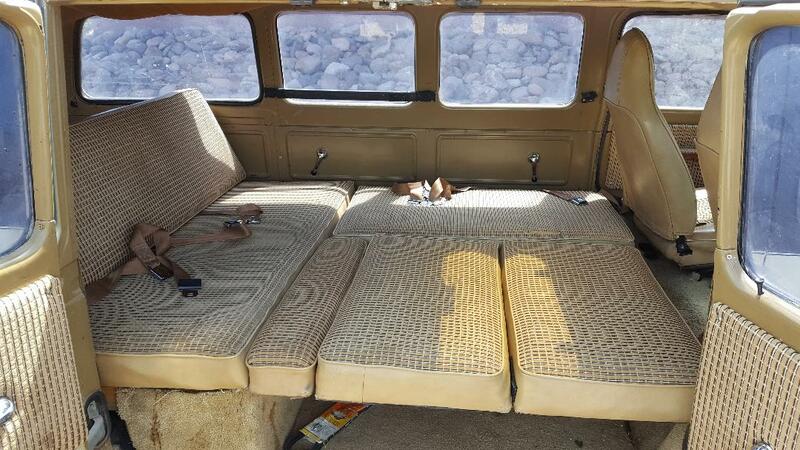 The original rear seats were removed and an L-shaped seating arrangement was configured. Storage under the seats and enough seatbelts for four. Seat backs and a little filler panel can be converted to a bed in a matter a few seconds. 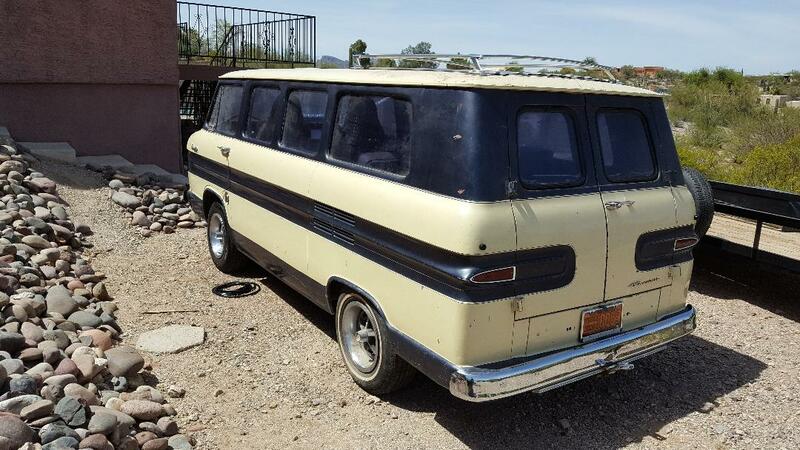 The rear cargo area was equipped with false floor that allows for storage of the spare tire and other items needed for the trip. It tilts up for easy access to the engine lid and battery. 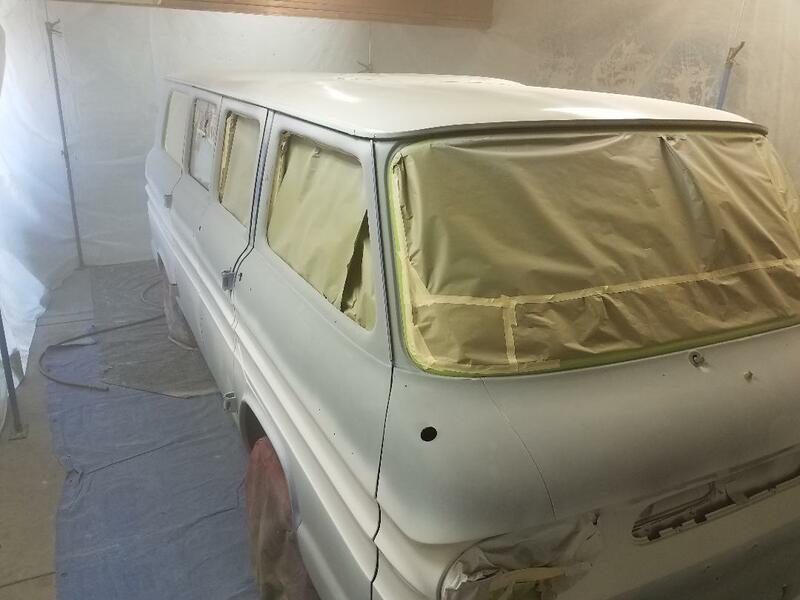 Jun 2018: Body work almost done and close to primer. white basecoat for top and stripe in place. 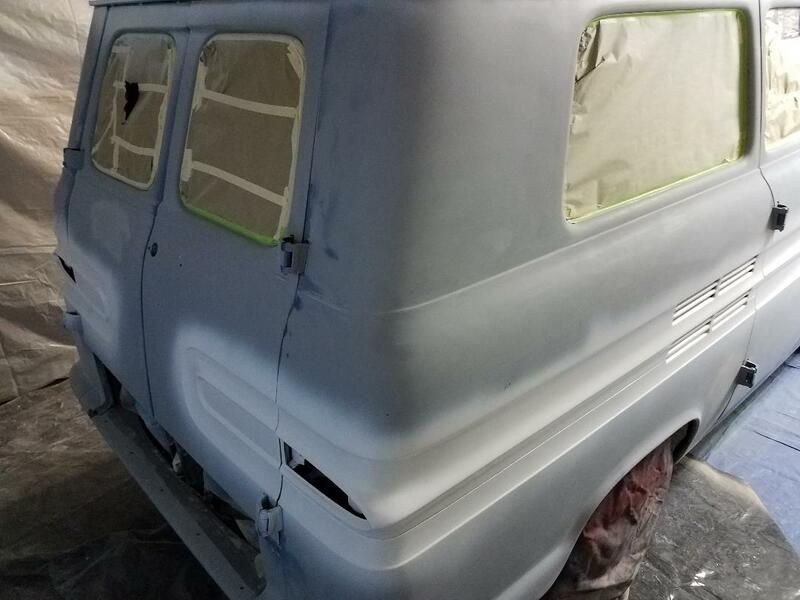 Sep 2018: Basecoat applied and clearcoat on. Oct 2018: Color sanded and buffed. Ready for mechanical work. Feb 2019 The 110 refreshed and ready to go into the Brier Jan 2019 SS Chevelle wheels repainted with Chevy Bowties replacing the "SS" emblems. Jan 2019 Bucket seats were put in many years ago and will remain, so 3-point seat belts seemed like the natural and smart thing to install. B pillars were opened up and proper sized nuts welded in place. Feb 2019 Carpet installed. Seats are in queue to be recovered next. Jan 2019 Door panels all done. A raised platform in the rear luggage area allows for spare and tool storage underneath with room for laggage on top. The platform can be raised to allow access to the battery compartment and engine bay.